In response to comments from the building community, NIST conducted an additional computer analysis. 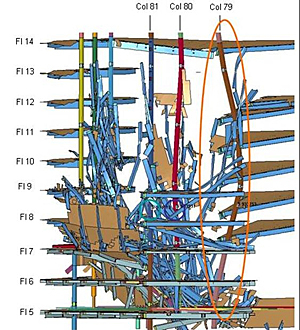 The goal was to see if the loss of WTC 7’s Column 79–the structural component identified as the one whose failure on 9/11 started the progressive collapse–would still have led to a complete loss of the building if fire or damage from the falling debris of the nearby WTC 1 tower were not factors. The investigation team concluded that the column’s failure under any circumstance would have initiated the destructive sequence of events. * Explaining in greater detail the computer modeling approach used to define where and when the fire in WTC 7 started and the extent of window breakage as a result of fire. Media Contact: Michael E. Newman, michael.newman@nist.gov, (301) 975-3025. Previous articleWill Bush’s midnight rules be reversible?